Are you making a positive impression on new visitors to your blog? Your visitors might find a lot of value in your well-researched article. But is a lack of blog comments letting you down? When a new visitor comes to your blog, seeing an abundance of comments proves that your content is authoritative, valuable and useful. After all, content that has driven conversations demonstrates that other people found it interesting. They found it so thought-provoking that they simply could not resist discussing it. The benefit of well-commented blog post goes far beyond the initial impression. A strong section of relevant comments increases the value of your post and engenders a sense of community amongst your commentators as they debate the topic at hand. Blog comments also provide you with direct feedback on what is resonating with your target audience and can be a valuable source of inspiration for new content. Responding to comments enables you to dig deeper into reader questions, help them further with their challenges and build a deeper connection. 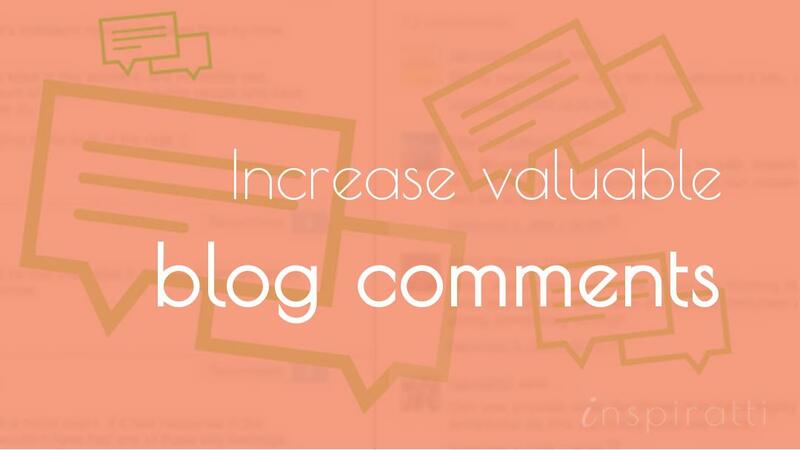 So, how can you increase insightful blog comments that stimulate interesting conversations? In this article, you’ll learn techniques that will help you increase the quality and quantity of your blog comments, and how you can leverage comments to cement relationships with your readers. Your blog post needs to engage your readers’ attention so they actually read it, enjoy it and then comment. So, consider these pointers when writing your next post. 1. Write good quality blog posts that truly captivate readers’ imagination. Impressed by your perceptive analysis, readers will feel compelled to comment and be keen to connect with you further. Remember, writing high quality blog posts will increase both the number and quality of your comments you receive. 2. Choose topics that stimulate debate. A new perspective on a highly topical issue is an excellent way to encourage conversation. Writing about controversial topics is also bound to stimulate debate. But don’t overstep the line: if you are handling a sensitive topic, ensure your content doesn’t offend people. 3. Keep blog posts highly focused. Identify a very specific issue or challenge frequently encountered by your target audience. Then tell them how to tackle it in your blog post. It’s worth carefully reading the comments section of your other posts; they often contain a repository of follow-up questions, challenges and problem that are waiting to be written about. 4. Don’t cover absolutely everything on the given topic in a single blog post. This provides an opportunity for readers to fill in the gaps though their blog comments. Write like you are having a conversation with your reader and they feel the need to join in and respond in the comments. Use these techniques to invite readers into a conversation. 5. Help prompt action by inviting your readers to comment. But don’t just say “please leave your comments”. Rather, ask specific questions that give readers clear direction on what to comment on. For example, ask for their tips, their preferences, their opinions, their advice, or their feedback on the topic at hand. The following are good starting points: “what do you think about…”, “Do you think…is a good idea?”, “What’s your best tip for…?”, “What’s your biggest challenge with…?” Take time to craft meaningful questions that will invoke interesting conversations. 6. Sprinkle rhetorical questions throughout the content of your blog post. Asking specific and straightforward questions will encourage readers to reflect on their own experiences, which could provide unique insight on the topic at hand. It’s very effective to include questions in your title too, as this gets readers thinking from the outset. 7. Ensure you are approachable. Whilst it’s important to maintain a confident tone throughout your blog posts, being overconfident can intimidate readers and deter them from commenting. People are loyal to their favorite bloggers and they often return to their blogs to read the content and provide supporting comments. So, be sure to develop a connection with your readers by following these techniques. 8. Interact with those who do comment. Readers who have taken the time to craft out a well thought out comment will appreciate your feedback. It shows that you value their input, giving them an incentive to comment on your future posts. But, avoid generic messages. Ensure you provide a personal and genuine reply to all comments. 9. Be graceful in replying to commenters, even if they are a little harsh. 10. Comment on other blogs in your niche. The author will be prompted to check out your blog posts and be ready to comment if they enjoyed the content. Once you have built up a network of fellow bloggers, support one another by commenting on and sharing each others’ content. People are more likely to comment if they benefit. Consider trying out these tactics to boost motivation to comment. 11. Reward readers who comment. For example, you could offer a reward for the ‘best commenter of the month’ or the ‘most interesting comment of the week’. You can also reward readers by including a ‘good comment’ remark or highlighting them in other posts. 12. Consider installing the CommentLuv Premium plugin. This enables commenters to link their name, website, and their latest blog posts underneath their comment. What a brilliant incentive for readers to leave comments on your blog. 13. Make it easy for readers to comment. If it’s too complicated, they are unlikely to bother. So, avoid requirements for registrations, logins, and don’t use a captcha system. Your aim is to encourage blog comments, not scare readers away. 14. Manage and moderate your comments. Ensure the comments section is free of spam. Set clear guidelines and don’t allow people to inappropriately step over the boundaries. Your post needs to be seen by enough people. If no one sees it, they cannot comment. People need to actually read and digest what you have discussed. No engagement=no comments. You need to motivate people to read to the end by tapping into their deep-seated desires. If readers don’t read the whole of your post, they won’t comment. In this article, you’ve learnt lots of comment-boosting tactics, from tapping into readers’ motivations to comment to driving interest and engagement in your posts. So, try them out and observe their impact on the quantity and quality of the comments you receive on your blog. If you want more guidance on the first part of this formula, read this post which shares proven techniques on how to increase traffic to your blog. What techniques do you use to encourage people to comment on your blog? Share your insights below. really helpful article for me.